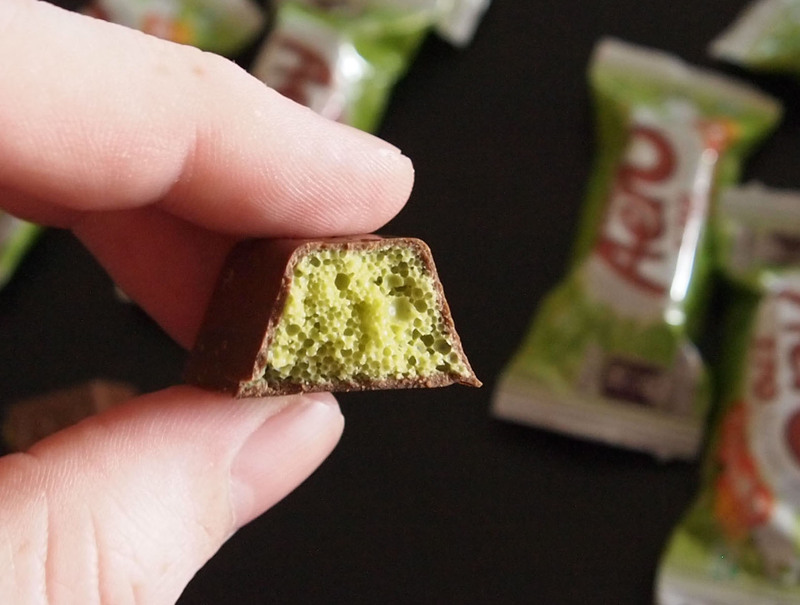 Review: Aero Green Tea | Oyatsu Break! 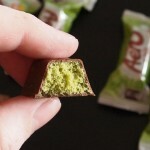 I was going through my last few reviews and I noticed that in my Air-In Kit Kat reviews, I talked a lot about “Aero” bars and how the bubbliness of the Air-Ins was clearly a stab at trying to replicate the popularity of Aero (or, Mirage, its inferior U.S. cousin). Seeing as Aero bars were my favourite as a kid, I took particular offense at the weak attempts of the Air-In Kit Kats to duplicate the bubbly texture. 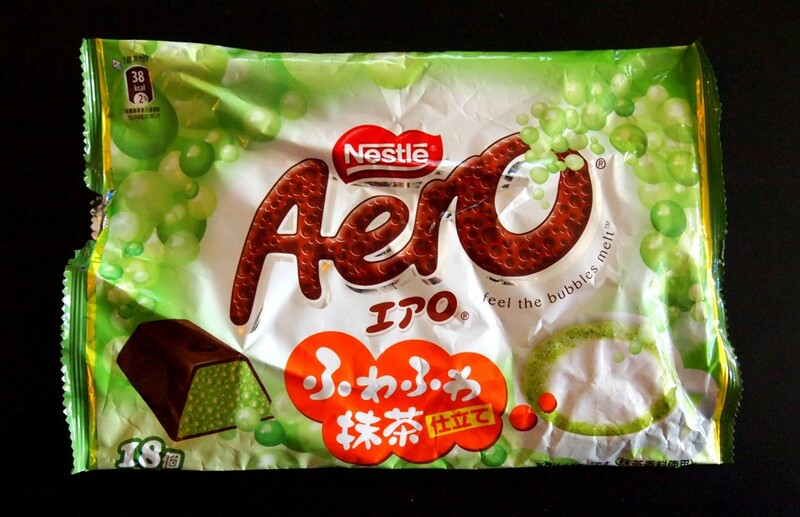 It didn’t occur to me at the time, but Japan has Aero bars now–both standard, milk chocolate Aero, and special localised flavours like Green Tea. 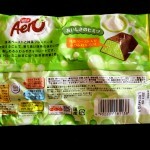 I’d actually tried Green Tea Aeros thanks to my good friend Deb Aoki, and sure enough today when I looked in the back of the fridge I still had most of a bag back there! (Seriously my fridge is so full of Japanese candy you would not believe.) Despite it being a few months past the best before, I figured I’d review them for you here, just so we had a baseline for solid, bubbles-in chocolate bars here at the site :). 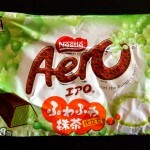 Packaging: At first when Deb gifted me this package I was a little underwhelmed–we’ve had Mint Aero Bars in Canada forever, though I guess it was cool to get the Japanese edition. Of course, when she told me they were green tea!? That was quite a bit more exciting. It would have been nice if the green tea aspect of the flavour could have been more clearly outlined on the package–there is a mug of green tea, but it basically disappears into the green and white bubbles. An argument could be made that if you are buying a chocolate product in Japan in a green wrapper, there is a 95% chance it’s green tea, also, it probably says “green tea” somewhere in Japanese. It’s fun and cheerful, but not terribly effective for me. Scent: Quite impressive! The out-of-the-wrapper scent is very full, with a nice mild green tea and milk chocolate scent. Very appetizing. 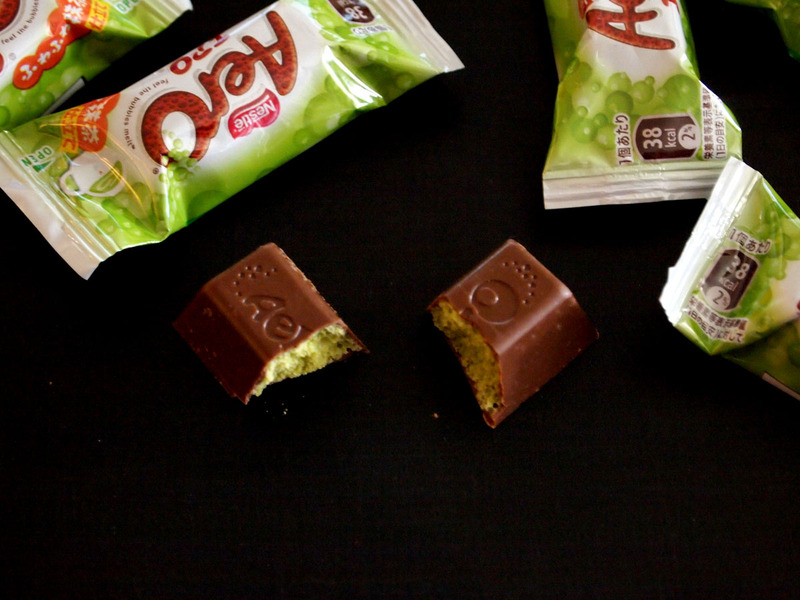 Taste & Texture: Now THAT’s an Aero bar. The texture is a perfect replica of the original Aero texture, the bubbles are voluminous, and they even ‘pop’ a little as the bar melts on your tongue. The flavour’s excellent too, not quite as nice as some of the green tea Kit Kats for some reason (they’re made by the same manufacturer), but far, far better than the terrible Green Tea flavour of the Air-In Kit Kats. 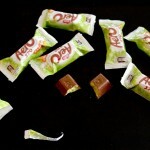 This has a pleasant, mild green tea taste, and the milk chocolate is definitely present and enjoyable. This is a flavourful, well constructed little bite of candy! Verdict: What a great candy bar! 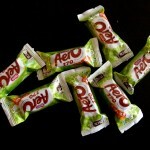 It does everything an Aero bar is supposed to do, and it tastes great too. 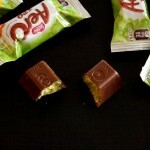 It proves that Nestle could have made the Air-In Kit Kats a hell of a lot better than they were. Love it, and you’ll love it too.